Home Brian Acton Delete Facebook Express Wi-Fi Facebook Facebook Lite Facebook Scandal Twitter It is time for you to leave Facebook due to lack of privacy said by "Brian Acton"
It is time for you to leave Facebook due to lack of privacy said by "Brian Acton"
Facebook is one of the largest popular social platform that connect billions of people together. Facebook has gone so far developing different app for easy access to platform, we have official Facebook app, Facebook Lite designed for those people in local or poor connection region. This is designed to be less heavy compared to normal one. We also have another app in store called Express WiFi which is discovered to be a very good Facebook app. But the recently pages and every media were full with some scandals talking about privacy and lapses in Facebook. 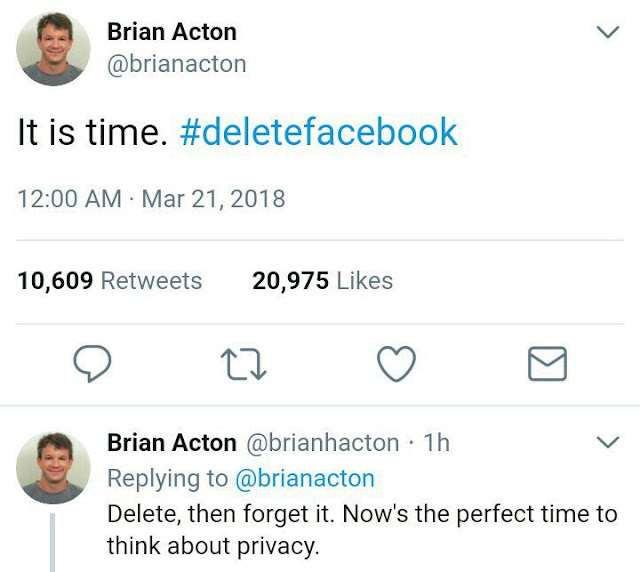 One of the Co-founder of WhatsApp that left "Brian Acton" said in his tweet on twitter that "Delete, then forget it. Now's the perfect time to think about privacy"
He said "data mining and analytic firms, misused Facebook user data in violation of Facebook’s guidelines and terms, leading to huge scandal. The data misused played a huge role in influencing voters in the 2016 US Election to favour Donald Trump. Mark Zuckerbeg, CEO of Facebook, silence has been troubling as many in the technology community turned their attention to him. In the past two weeks, the scandal has lead to a big drop in Facebook stock value. This has reportedly made some investors to sue Facebook over the stock price drop. I believe we all still remember that WhatsApp had been sold for $22 billion to Facebook and these had fetch him (Brian Acton) net worth of $5.5 billion, all the same these shouldn't have been released on media by him.